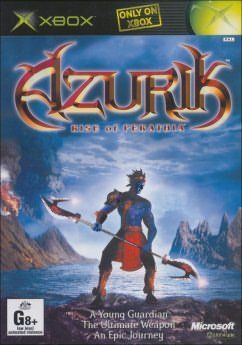 Azurik is an odd title. Odd in that it promises so much, and yet for this particular outing did not deliver as well as might have been expected. The storyline is there as is the character development. It almost seems as though somewhere along the line, someone has snapped their fingers and told the team to just hurry up and finish it, don't worry about quality control. The game plays and feels almost unfinished once you get into it. Working as a standard platforming game would possibly have worked better for this 3D fighting adventure title. The developers, Adrenium, have unwittingly created an ungainly monster in the sheer amount of detail in what should be just general gameplay. As is obvious from the screens to the left, Azurik is a great looking game and does take advantage of much that the XBox has to offer as far as texture rendering is concerned. Rolling landscapes and great skin tones abound on this title and the lead character, Azurik, is the jewel in the crown in the looks department. The storyline, whilst interesting is pretty much your old and trusted tale of a world torn apart by betrayal and the underdog rising to save the day. Your world is held together by ancient and mysterious elemental forces that are torn asunder by an evil warrior by the name of Balthazar (yes, like on Buffy). With the elements scattered and your powers apparently gone, you must make your way into the world to save Perathia from destruction. 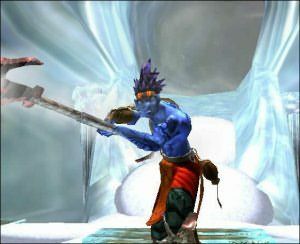 Your trusty weapon, The Axion, a halberd can be infused with elemental powers once icons for said powers are obtained. It is pretty neat how your powers are more or less colour matched to the controllers buttons. Red for fire, Blue for water and the like. 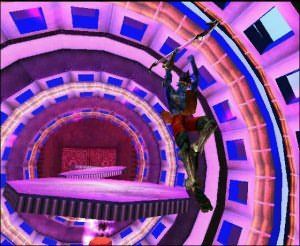 However, then the problem sets in for Azurik as they have decided that his own weapon will be a bit of a enigma as well. For example, to get through ice, you'll have to combine fire and water to get steam. It just makes the game cumbersome. Azurik is well animated, however his interaction with his surroundings leave quite a bit to be desired. When playtesting, I saw him clip through other objects on more than one occasion, as did the monsters that he fought. Speaking of monsters, unfortunately animations are poor as is the enemy AI. Creatures shamble their way toward you and flop about this direction and that. Creature sounds are not entirely convincing and are the same sound repeated regularly. With regard to sound, Azurik's selection of sounds can get to be a bit of annoyance considering you will hear them more than anything else in the game. Background music and water effects are done well and full credit to the developers. For the most part though, sound has taken a back seat. Azurik floats! Unfortunately gravity doesn't seem to fully exist on Perathia, which may be a good thing for it's inhabitants however not good for us gamers. Azurik can fall from cliffs, slide down steps and do many other things that you least expect, or want. Careful attention must be paid to the positioning of both your main character and the placement of the ingame camera that determines what you see around you. Be sure to use this all the time or you will miss items and enemies. The camera does hover a fair distance away so zoom in as much as you can. 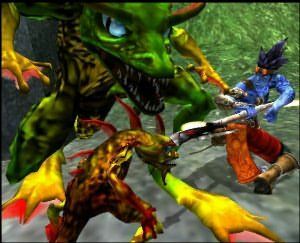 After all that, in summary, I would have to say that Azurik had a lot of potential and I hope that Adrenium are not too dismayed to make Azurik 2 as I'd love to see what they could do on the console. The game is almost there but just doesn't quite make it into the realm of a good purchase. I would suggest renting this title before buying to get a feel for it.